If you ever wondered what’s it like to own a theme park, wonder no more. 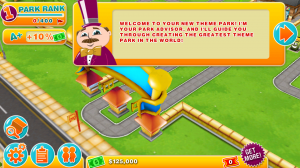 Theme Park lets you build your very own park with rides, stores and other great visitor attractions. 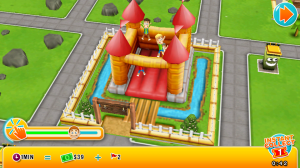 It’s a fun, new way to enjoy world-building games, and should appeal more to children. This is not to say it’s no fun if you’re an adult. On the contrary, Theme Park doesn’t fail to amuse and engage any player, regardless of age. As in any business, starting out with your park requires a bit of strategy. You are given a modest amount of cash and another currency called Supertickets. 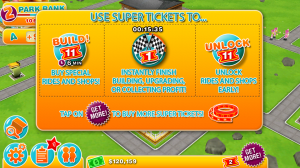 Cash and Supertickets can both be used to purchase rides and shops, but only Supertickets can unlock certain items from the store. And while rides and shops generate cash, Supertickets can only be bought through an in-app purchase, or awarded when a player levels up. 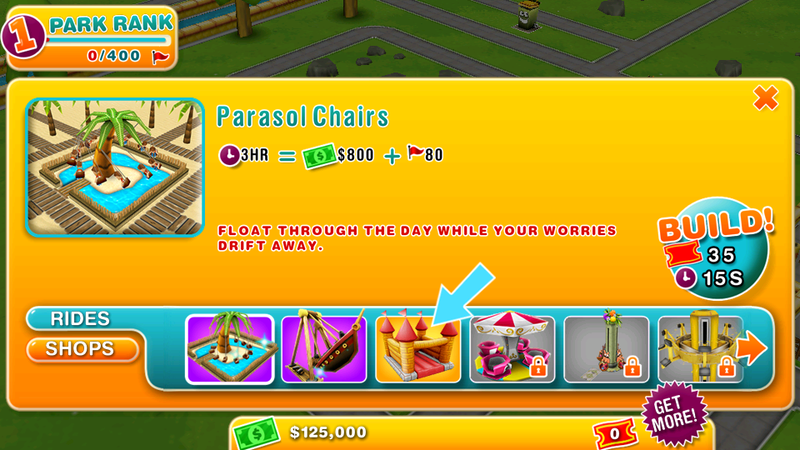 Once you’ve chosen your rides and set them up on your first park, you would need to wait until these begin giving back money. Some rides take as less as 30 minutes to produce revenue, while others take longer — from nine to 19 hours. The amount of revenue generated, however, is bigger when the wait time is longer. I’ve found that if you intend on playing the game several times in a day, it’s best to pick rides and shops that generate money in a relatively short time. On the other hand, if you plan on playing the game once a day, then you should go for the ones that take longer to spew cash. This way, you’re letting the game fit your playing schedule. 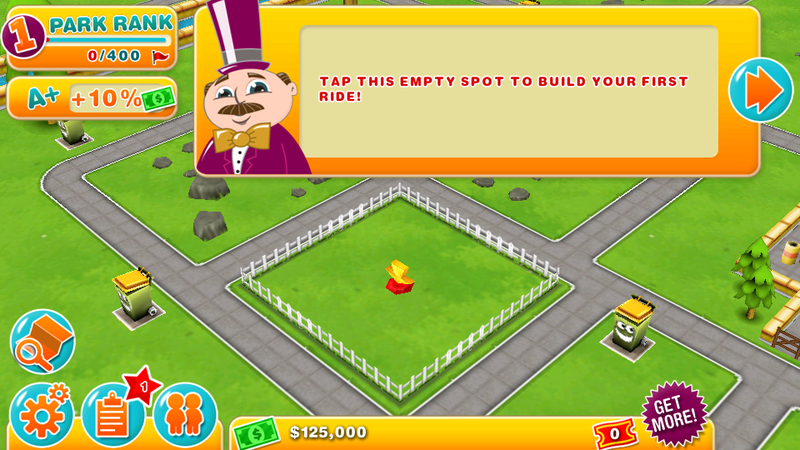 When you first start the game, you might notice that not all vacant spaces are available for building anything yet. If this is the case, it means you’ll have to reach a certain Park Rank level before the rest of the spaces within your territory are unlocked. Park Rank is the same as XP points in other games. 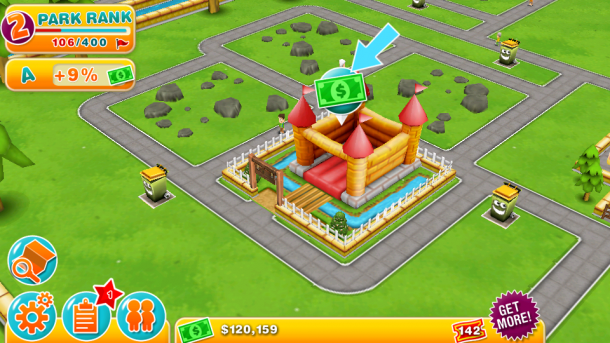 Your park rank increases when you collect flags (together with cash) from the rides and shops. You need to complete a certain amount of flags before stepping up your ranking. When you reach the next rank level, you are awarded one Superticket. 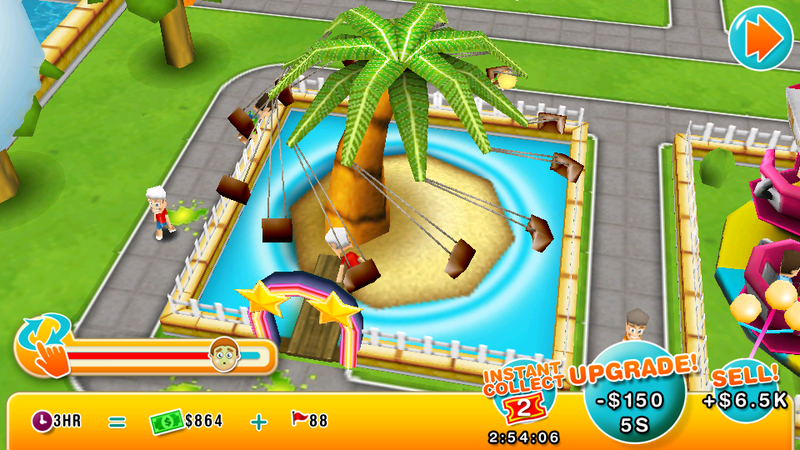 Other than collecting flags from your own park, you can also visit other parks and collect their trash and wipe the puke on the streets and you get awarded extra flags. You can only visit and work on other parks once a day. 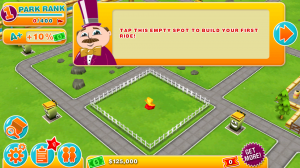 There’s a bit of waiting involved with this game, as you do have to wait for almost everything to finish — from building rides to waiting for them to make money. One thing you can do to occupy yourself while making extra money is to play with the rides. Simply tap on a ride and tap, swipe or spin it to move it faster. A “fun” meter indicates whether you’re making the passengers happy — keep this up and you should get five bucks per round. It’s not much, but it’s extremely useful when you’re a few dollars short on a purchase you want to make. Your park should maintain great customer rating. You will notice a score on the top left corner of the page (A, A+, etc.) This indicates how satisfied your visitors are with your park. The highest, of course, is A+. If it’s lower than that, you can tap on it and a pop up message will tell you what you need to do to increase the score. While this may seem like a fancy little metric for the game, it is equally important. Depending on the rating, it determines a certain percentage which is added to the running revenue. An A+ rating adds ten percent in revenue. To ensure customers are always happy, you can hire a park staff. Although they don’t come cheap, it should lessen your workload and keep the park a bit organized and well-maintained. Most of the time, decrease customer rating is caused by a dirty park. 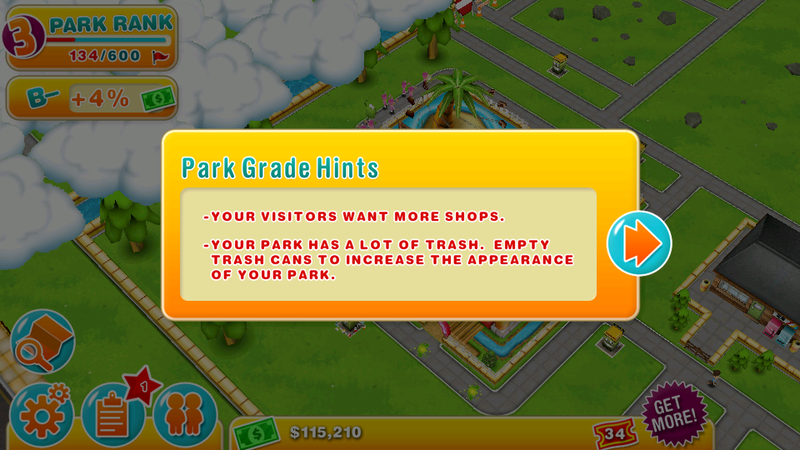 You can clean up the park by taking out the trash. Trash bins are located around the park, so you’ll need to find full ones as indicated by a big trash bin blurb. Puke is found on the streets, so you’ll need to wipe them off too (just tap on them). Although it doesn’t affect your score, it does pay small bucks — and keeps the park looking nice and clean. 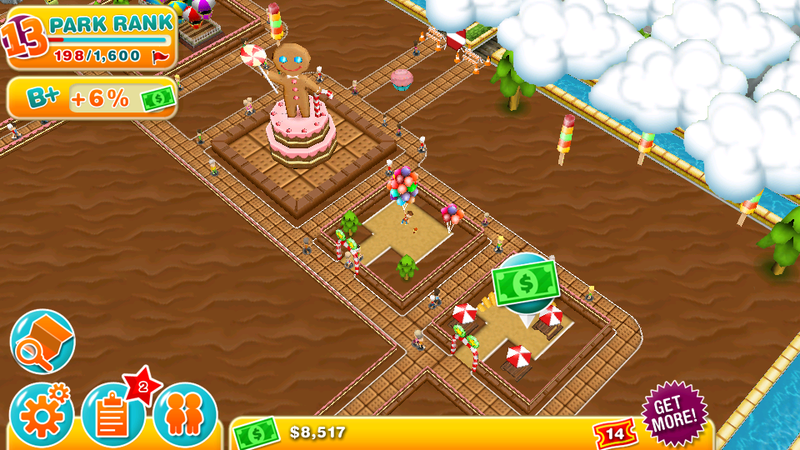 I must warn you, however, that tapping on little puddles of puke can be a bit annoying on small screens. 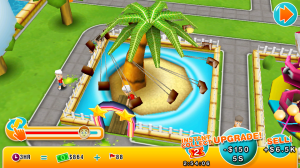 When you reach the right park rank, or have enough Supertickets, you can expand your park to other areas outside of the one you currently have. The game lets you choose another theme for your park. Although you will have separate parks, the money each of them makes are reflected collectively. 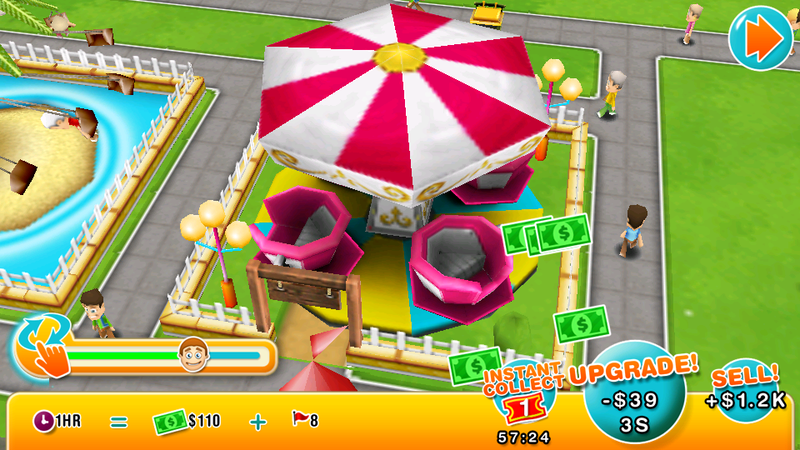 This means you can use money from the second park for purchasing something in the first park, and vice versa. 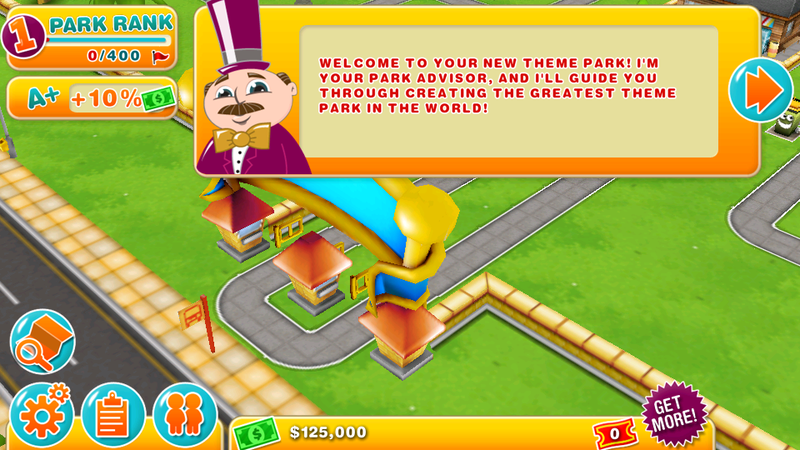 Having more than one park might sound like any entrepreneur’s dream, but this requires consistency in all parks. Leaving a park with empty spaces and building another will affect your customer rating. Since customer ratings affect revenue as mentioned earlier, then expansions do not really gaurantee more profit. Theme Park’s charm is in the way it executes fun, vibrant game design with a mix of interactive game play. Although there were some issues with failed loading times and several game elements that can be improved, it does remain a great game to sit back, relax and have fun with. It may be just an easy game of tap-and-build, but it could also be a great strategic game for the business-minded. Either way, it’s a joy to see your very own theme park grow and come to life.